Every track day rider runs into the conundrum at some point – “how am I getting me, my bike, and all my stuff to the track?” There are a lot of options available, and depending on your personal needs, likes, desires, and budget, you should be able to find something that works for you. Below are highlighted some of the more popular options you will see. Got a friend or someone else who is going with extra space in their rig or trailer? Often a few people will “carpool” bikes and people to the track, in an effort to save gas and investment. For someone who’s just checking out their first trackday, or is flexible on the days they want to attend, this can be a great option to get everything to the track while keeping your personal investment a little lower. Chip in for gas and some food, and you may find it a great deal for both people. I’ve used this method as both the carpoolee and the carpooler with great success. It’s fun to have company on the way to and from the track, and you have an automatic pit-buddy for the day. If investing in a bigger, dedicated vehicle isn’t quite in the works for you yet, it may be worth looking into modifying your current set up. Many cars have a towing capacity that can easily handle hauling a motorcycle on a purpose-built trailer. Installing a hitch is much cheaper than a new vehicle, and for the occasional or just getting started track day rider, this can be a more economical option if the hassle of arranging a carpool every time doesn’t work well. Another, similar option is to rent a truck or vehicle that can tow. Most rental companies are pretty cost-prohibitive for this type of thing, but some of the apps like Touro have vehicles at a much more reasonable price that you can rent for a couple days. You can often find folding and standing trailers, or single rail trailers that are easily stored with minimal space, making this a great choice for those who don’t have a lot of parking options. Once I started getting more serious about trackdays, this is where I ended up, both using my own (somewhat unreliable) vehicle and on occasion borrowing/renting from a friend. The set up wasn’t ideal, but I was able to make it work. The most popular vehicle at a trackday is going to the classic pickup truck. What you will want in a truck is probably going to be determined once you have a good idea of how much stuff you’re hauling (besides just your bike and gear), how long you will be gone, if you’re frequently hauling other people and their bikes, etc. Cost is starting to become a factor at this point, however, as trucks aren’t usually very cheap, especially the bigger (and newer) you go. Personally, this is where I’ve landed at this point in my racing career. Investing in a bigger truck with an extended cab gave me more interior room for my stuff, and the ability to fit everything in one space, plus enough room to get to a track day with a friend. 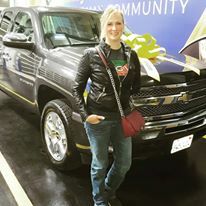 Getting my most recent purchase, a bigger truck to better suit my needs! These are a solid choice if your vehicle is fairly dedicated as your track vehicle. Everything can be locked inside, out of sight wherever you go. You can modify the interior to turn it into a nice sleeping and storage area once at the track. Depending on the size of the van, you can fit quite a few bikes plus a LOT of stuff inside. Price points and gas mileage tend to run similar to that of a truck. I can’t knock the versatility of the van, but for me, my truck is my only “car” and my pride doesn’t want to drive around in a van everywhere (plus, I just like trucks. Always have). But if you’ve got the space or don’t care that much about what you’re driving (or maybe you think vans are cool), it’s a very smart choice. Another very popular option, but it makes it further down on the list simply due to the fact that you now have a tow vehicle plus the cost of a trailer. This can be an extremely versatile combination, however, since as long as you’re within your towing capacity, you can get any trailer that fits your needs and budget. Everything from an open bed trailer, enclosed trailer, or a “toy hauler” are options with this combination. Additionally, your tow vehicle may serve several purposes for you over time, from daily driver to a self-contained track day hauler, to towing your full rig set up. If you have the budget for both, this is probably the most versatile and easily modified set up that provided the widest range of options. Trailer storage, however, is a problem for many people, especially if you live in a urban area. Trailer storage fees and theft prevention are concerns to be considered. By far the most luxurious option, this one also tops the list on cost and lack of versatility. The toy hauler RV comes in a variety of sizes, from less than 30’ to the size of a touring bus. Budget and storage are going to be the biggest concerns here, but this is the ultimate track hauler IMO. Everything contained in one vehicle, and it’s a house on wheels. Some are more basic, some are very expensive. Features are as broad as your pocketbook, no need to tow, and comfort right at your fingertips. Like the larger trailer option, however, storage and parking of the large RV set up can be a concern for people. Before investing in a large vehicle like this, be sure you have those issues sorted out. There are a number of variations of these options that you may see at the track as well, from converted school buses, to modified delivery trucks, tiny enclosed trailers towed by a car, and everything in between. The track day crowd can be pretty creative when it comes to maximizing their dollar to create the best track day set up they can afford!